Lets start off by admitting the Nissan Titan is not among the big three pickups and probably won't be for a while due to the fiercely loyal Ford, Chevy and Ram owners. However, that does not mean Nissan doesn't make a solid truck. In January of 2015 the second generation Nissan Titan made its debut. Light years better than the archaic first generation, the new Titans are a welcomed edition to the competitive half ton pickup market. Although the Titan has pickup up in sales since the second generation debut, itslow overall production volume compared to the big three gives customers a sense of individuality when purchasing one. After all 28.2k Titans were sold in July 2017 compared to 499.3k Ford F-Series pickups and that is still a staggering 290 percent increase in monthly sales over July 2016. With an extremely competitive market, a half ton pickup can be several spots away from the podium and still be a reliable, comfortable and well mannered truck. 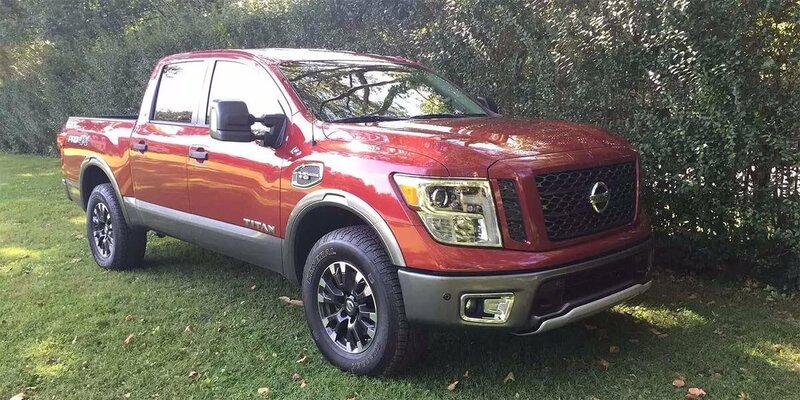 The Nissan Titan happens to fall into that category, it might not hit one out to the park, but it will always get on base and maybe steal another. The truck is quiet. Although the Titan has an unmistakable V-8 rumble coming form its 5.6-liter 390 horsepower and 394 lb-ft of torque V-8, the cabin noise is minimal, the squeaks normally associated with a large vehicle are absent and the road noise of the Pro-4X is surprisingly subdued. However, when you roll down the windows and hit the gas, you are quickly reminded of the possible single digit mpg. It is a handsome truck. Yes, the truck may have similarities to the F-150, but it still has unique lines, an aggressive grill, commendable LED headlights, and the Pro-4X packages gives the overall profile and offroad ready look. The Nissan Titan is a V-8 rocket. No, you are not going to get 3.5-liter or 2.7-liter EcoBoost 0-60 mph times out of the Nissan Titan, but you will certainly experience a kick in the pants as you mash the gas thanks to a 0-60 mph time of around 6.5 seconds. The truck has solid road manners. For a half ton pickup, the steering is responsive, the power delivery is linear, and you don't feel like your insides are in a blender as you go down the road. It is different. Some may not view this as a "pro" but I do. You aren't just another Silverado, F-150 or Ram 1500 in the lot. The Titan is still viewed as the new kid on the block and people are certainly starting to warm up to the kid. The Luxury and Convenience packages brought leather interior, heated and cooled seats, dual climate control, navigation, bluetooth and just about every other bell and whistle and fancy outdoorsmen could ask for. The Nissan Titan likes to stay hydrated. I am the first to admit I have a little bit of a led foot, but even under conservative conditions I was topping out around 14 mpg. The braking was heavier than the competition. Listen, I have spent the vast majority of my time in larger trucks, but for some reason the Titan's breaking seemed like work. The towing capacity is slightly below the competition. The Ford F-150 maximum towing capacity is 12,200, Ram 1500 is 10,690, the Chevy is 12,500 and the Titan falls last with 9,740 pounds. The 5.0-liter Diesel V-8 found in the Titan XD is a solid motor, but you can't get it in the smaller Titan. Good luck finding one outfitted to your specifications on the lot. Due to low sales volume, most Titans in New England have to be ordered to achieve the desired specification. The Nissan Titan has made leaps and bounds since it first hit the U.S. market and we need to start giving the truck a chance. Understandably, Ford, Chevy and Ram have a loyal customer base that will likely stick with their respective vehicles, but you would be foolish to not at least test drive the Titan. Yes, more work needs to be done to get it to the efficiency and blend between agility and utility found in the top three, but the time is coming. If Nissan gave the number of engine options found among Ford and Ram, the truck may very well find itself breaking the top 3 or 4 in the next few year. As far as the Pro-4X is concerned, the Bilstein dampers, knobby tires, rear locking differential, skid plates and fender flares are a welcomed edition. The truck isn't about to go climb its way out of a rocky ravine but the offroad touches give the truck the needed confidence to handle to task at hand, weather it is getting to the campsite or jobsite. Random fact of your choosing: the Nissan Titan has been made in Mississippi since 2003.